I’m trying to improve my writing. Really, I am. It’s fun and I want to get better at it. Contrast this to my feelings about golf, something else that’s a lot of fun, which I don’t feel a compunction to improve. I just love to play; I don’t practice and I don’t get too discouraged on bad days or too high on good days. It’s golf. Whatever happens, happens. Good lord. Are all those question marks in the right place? I’m stressed. I hate this. I don’t have this same level of concern in golf. I replay shots in my head just because they’re fun to think about, not because I want to change them and certainly not because I want to guard against making the same mistake again. I don’t really feel like I’m battling a golf course, but I always feel like I’m battling words. I’m self-conscious and insecure about the words here. I don’t publicize it because this is all just practice, man. It’s like when you first start playing golf and you aren’t comfortable playing golf with strangers; you don’t seek it out, but you have to do it. If someone joins up with you, so be it. So I’m doing it. Writing in kind of a public manner but not really telling anyone about it. People may occasionally stumble across this site and think I’m a dumbass. It’s stressful, but that’s okay. Hopefully I’ll get better. I’m practicing for some time down the road when I really want to devote time to amateur journalism. A time when anyone who wants to have a voice can have a voice. We’re gonna get there. Heck, we’re almost there. I can’t imagine what this is going to be like in ten years, but I do know that I want to be ready with a basic set of writing and analytical skills so that I can churn out quality content in a timely manner. Enter Lynne Truss and her book about punctuation. 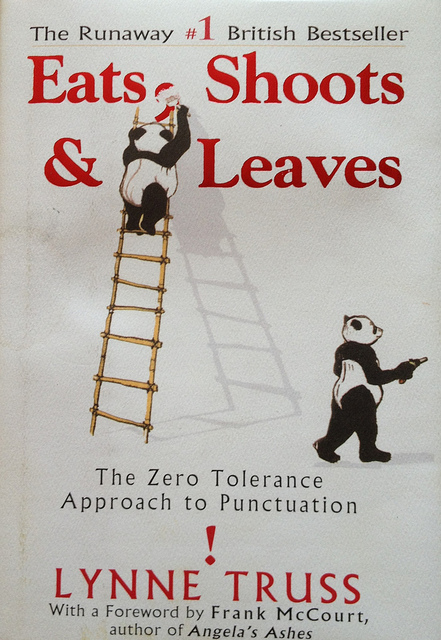 It’s a whole book devoted to explaining the usage of commas, periods, apostrophes, etc … It’s bigger than that though. It’s also devoted to wry, English wit and the power of preserving something that seems part of a bygone era. It’s an impassioned piece of work. I like Truss. Nerdy, funny, inventive for sure. It’s a short book, but gives Truss enough time to dig into the history of punctuation while remaining highly applicable to what you’re writing today. She has plenty of everyday examples augmented by lists of rules that clarify and illuminate. I’m not quite sure how I’ll use it. Whenever I finish a good reference book I always tell myself I’ll come back to it and review the rules, maybe type them into little lists in Evernote that I can refer to, but I never do. It will probably have to wait until that magical time, when I’m retired and have some expendable hours, at about 90 maybe, at which point I’ll be able to partake in some amateur journalism of a serious nature. Posted in books, tagged reference on 2012/07/19 by John.